Cute, funny, easy reader with awesome illustrations. Baby Monkey, Private Eye contains five cases for Baby Monkey, who is of course a baby monkey, to solve. This is a brilliant mash-up of picture and chapter book. The illustrations are more frequent than words and were my favorite part. Marketed to ages 3-8, this book would be a great group read to children almost ready to read and a great choice for beginning readers. The repetition of text means fewer words for young children to memorize. 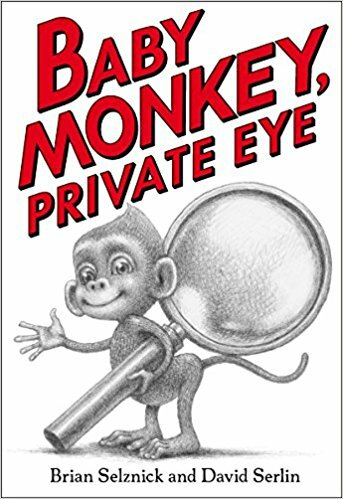 It also makes it a good way for children to be able to read a “big book” since Baby Monkey, Private Eye has 187 pages. Children will have fun seeing Baby Monkey’s frequent issues with putting on his pants. They will also relate to the need for afternoon snacks and naps. If they pay close attention to the footprints in most of the cases, they should be able to solve all the cases with Baby Monkey too. The best part (for me) is that there are several hilarious features purely for adults. Does Baby Monkey know the future? Baby Monkey’s office decorations change depending on the case. What’s amazing is that the client has yet to arrive. Adults will have fun recognizing the historic figures. There is a key in the back giving the answers. Damn you Bonnie Blue Butler for ruining my perfect score! There is also a humorous index and a funny, hopefully fictitious, bibliography. Highly recommended for children and their adults. 5 stars! Thanks to the publisher, Scholastic Press, and Goodreads for providing an advanced copy through the Goodreads giveaways program.